While the #OscarsSoWhite controversy raged over the dearth of people of color nominated for Academy Awards this past year, a group of digital humanities students at UCLA channeled their frustration into meticulously building the little-known history of silent films made for and by African Americans in the early 20th century. 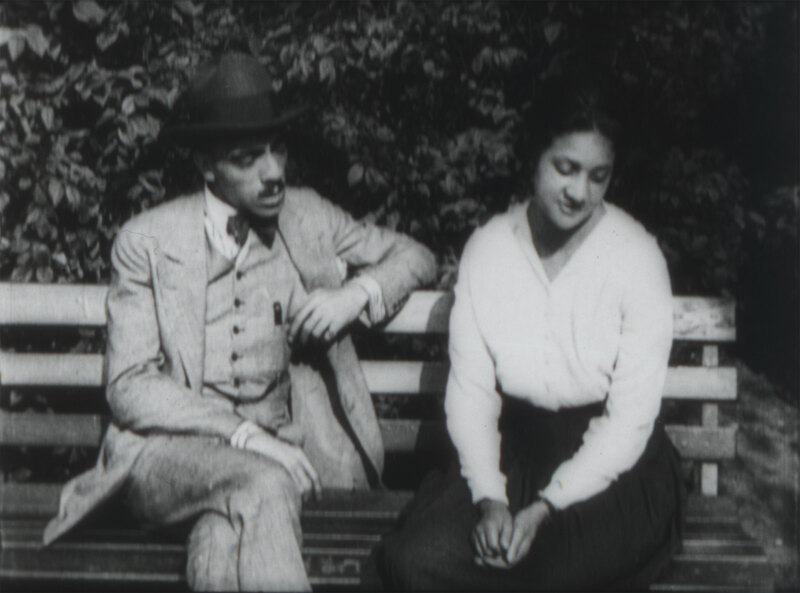 Photo from Within Our Gates (1919), the oldest known surviving film made by an African American director. What they found, and sought to highlight, is that African American artists are deeply entwined in the history of filmmaking, and can be traced back to the medium’s beginnings. The result of their efforts is “Early African American Film: Reconstructing the History of Silent Race Films, 1909-1930,” an informational website and searchable database that tracks the African American actors, crew members, writers, producers and other artists who were making films during the silent era. Relying partially on the work of historians who have unearthed documentation of these forgotten filmmakers, the UCLA student team set its parameters to include films from 1909 to 1930 that featured African American cast members, were produced by an independent production company and discussed or advertised as a race film in the African American press. While the community was vibrant, it struggled to gain mainstream traction. In the silent-film era, productions that fit the “race films”description, like those produced by the Hampton and Tuskegee Institutes, A Trip to Tuskegee (1909), John Henry at Hampton (1913) and A Day at Tuskegee (1913), could be shown only in certain theaters, or often in African American churches, and were played to segregated audiences. Most of these films, therefore, received scant mainstream media attention. The actual film reels were not preserved in any systematic way or protected in hermetically sealed vaults, which has led to physical degradation. 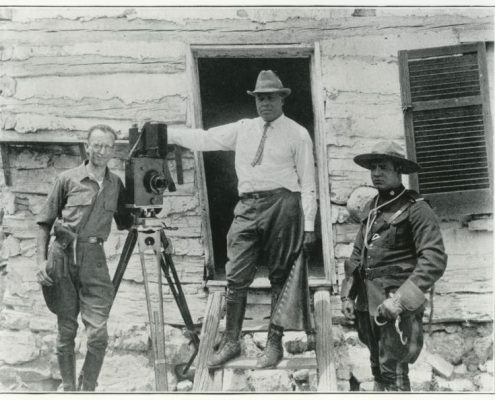 Motion picture director Oscar Micheaux (center) with an actor and a possible crew member appearing in an advertisement for the Micheaux Film Corporation. Few films survive, though Miriam Posner, core faculty and program coordinator for the digital humanities at UCLA, was partially inspired to ignite the project thanks to the recent release of a compilation of films from Kino Lorber called Pioneers of African-American Cinema. The scarcity drove the students. Coming up empty on internet searches caught students particularly off guard, Norman said. “We’re not used to that kind of obscurity, but so much of the data has been lost or damaged, is not in any history textbooks in our educational system, and is not easily searchable,” she said. A centering figure in the students’ archival exploration was Oscar Micheaux, author, filmmaker and founder of the Micheaux Film Corporation, one of the most prominent producers of the era’s race films. He kept copious notes and records on the actors and crew members he worked with, providing much-needed fodder for the database. Micheaux’s Within Our Gates (1919) is one of the few examples of a race film that garnered some attention — and an audience — from the white press. The project exists as a perusable database on the code-sharing site GitHub that others may use, build upon and correct. The site maintains a trail of attribution to the UCLA project. “Not everyone knows how to work with data like ours, so we also spent a lot of time building tutorials that show people exactly how to create their own network graphs, maps and other kinds of analysis using our data,” Posner said. Capstone activities like this are extremely important in the digital humanities field because students have the best, most meaningful experiences while apprenticing on an active project, she said. 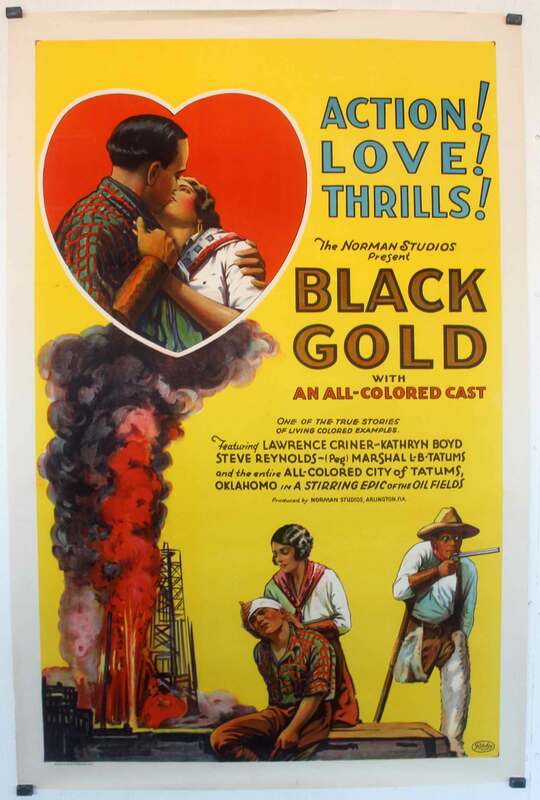 Poster for Black Gold, Richard E. Norman’s lost final feature. Norman was a pioneer in the development of films for African American audiences. Working on a project like this has made lasting impact on the students. Norman said that she hopes to pursue a career that allows her to continue working at the intersection of entertainment and digital technology. UCLA faculty and students are at the brink of historic breakthroughs in the most complex and least understood organ in the body. Through the use of the latest technology, the top-rated UCLA Department of Psychology is studying all aspects of brain health.